Skin is the largest organ in the human body. It is also the first line of defense against external harsh substances. Your skin is made up of protective layers of cells supported by nerves, glands and blood vessels. These layers move up on the line and then shed off on the surface. Beautiful and healthy skin makes you look more attractive, that's why it is important to take good care of it. 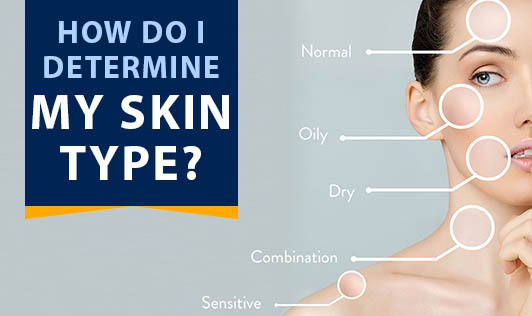 Determining your skin type is an important first step in knowing how to treat your skin and what products to use. Clean away any dirt or oil that may have accumulated during the day. Wash your face with a skin cleanser and pat dry. ? Wait for an hour to allow your skin to return to its natural state. Now, press a separate piece of tissue on your chin, center of forehead, outer forehead, and center of cheeks, outer cheeks and nose. If you see oil on each tissue (seen as transparent spots on the tissue), it indicated an oily skin type. If you see oil on only some tissues, especially on the T-zone (forehead, node and chin), it indicates a combination skin type. After wiping, if the skin is left too tight or stretched with a feeling of dryness or you notice flaky skin residues all over the tissue, then it indicates a dry skin type. No oil and no flaky residue on the tissues along with skin feeling supple and elastic, indicates a normal skin type. Once you have identified your skin type, you can take the necessary steps to get the most healthful glow out of your skin, whatever type it turns out to be. Remember, irrespective of your skin type, washing your face with a face wash, twice a day, and before going to bed is very important.